With its abundant and flexible input / output points and powerful math function & a 50 ms sampling cycle time, the Fuji Electric's PXH Controller is the ideal process controller for measurement & control of temperature, pressure & flow. The PXH's easy-to-view five digit display and a waterproof construction allows it to perform even in difficult field conditions. Pre-installed control application templates allow easy configuration for various applications. User can select the appropriate Template and the PXH automatically configures the input / output settings and internal calculation blocks. Function keys offer one touch operation for Remote/Auto switch, Stand-by, Alarm-latch clear & other comfort functions. 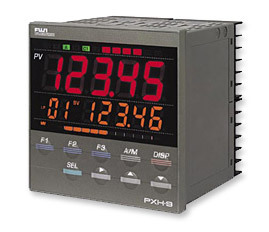 The PXH features a Universal input, Digital inputs / outputs, Auxiliary analog input, Math functions, Totalize function, Recipe function, Input Linearize function, Choice of control outputs, Transmitter power supply, RS-485 MODBUS communication function, PID Palette, Quick PID, PC loader interface and software thru RS-232C communication.